All Year 7 students participate in ‘Classroom Music—Training Band’ program where all students are provided (for one year) a concert style instrument for the Band class. They perform and study various musical styles and basic playing techniques. This subject is not a substitute for learning or studying a major musical instrument of student’s own choice within our Instrumental Music Program. Technical skills that are covered are very basic and classes involve general classroom music themes. All students are required to perform at the end of year concert as part of their major assessment. All students are welcome to join any of the major ensembles that Instrumental Music students enjoy! Mount Waverley Secondary College offers an ensemble-based instrumental music program. All music students involved with our teachers must participate in at least one of our established ensembles – Beginner Band, Concert Band, Symphonic Band, or Junior and Senior Stage Band; or, for our string players, String Orchestra or Junior String Ensemble or, for our vocalists, pianists, Senior and Junior Chorale and Concert Chorale. Chamber type or smaller ensembles such as Flute and Drum Ensembles, Octetata are created over the year for advanced players, but all students must belong to one of the larger ensembles. This is all part of the instrumental music lessons paid for by our parents. Many concerts are held throughout the year. As a result of participating in the ensemble based program students are provided tuition on their instrument in either group or individual lessons with trained, highly qualified music staff. 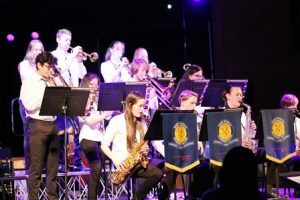 The Instrumental Music Program is an extra-curricular program with rehearsals outside of school hours, and instrumental lessons and ensembles operating both in and outside of normal school timetable. It is integrated in a learning capacity with the Year 7 and 8 Classroom Music Program but it is considered as extension and enrichment. It is considered as developmental learning, particularly if students wish to continue on to VCE. Each student will complete major music exams (August / October) run by the music department providing the student with knowledge about the grade achieved, level attained, and skills demonstrated. They learn specific music skills, study technical works, scales, ensemble development, music expression, general knowledge and use the pedagogy or language of music to develop their communication skills. Our music department teachers offer support and encouragement to our students to enroll in AMEB, Trinity, ABRSM examinations over the course of the year, or students may be expected to compete in Eisteddfods and music competitions, all of which are exciting to perform in and are great levelers at establishing true benchmarks for measuring student musical achievements. The student is encouraged to set high personal goals in performance and we provide reports on how the student has gone about achieving those personal goals. Our aim is to provide a broad musical base whereby a student may have lots of musical involvement, learning and socialisation, and can draw upon a wide range of experiences from their participation and involvement within the Instrumental Music Program.